I think I know now why people get the "February blahs." Though there have been some temperate days, I'm itching to really get back outside again for more than a short walk, and I think I'm itching to do something besides staying at home. This is entirely unreasonable, I know, given that I am three weeks postpartum and completely sleep deprived, but I'm feeling cooped up. 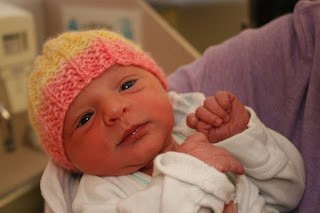 I guess in many ways, work, no matter how frustrating it was, gave me a place to go every day that offered different challenges and a change of scenery, and our pediatrician told us that we're not to go anywhere with the Bean until she is at least six weeks old. She's actually a little under the weather as it is, I think ... her nose stuffy and I suspect, listening to her swallow, that she has postnasal drip. I've been thinking a lot in the past two weeks about community, and the ways in which community has changed over the past few decades. Most women in my mom's generation seem to remember a time when relatives came to stay with daughters who were new moms, and help them through the first few weeks of newborn life. While I do know some people who had this kind of help, and we've been lucky to have support, now, new moms seem much more isolated in the weeks after birth, even if friends and family do come by. And I wonder if that has anything to do with what I perceive to be a rise in postpartum depression. We're no longer a village raising children and caring for mothers; we're little domestic islands. I mentioned that we hired a postpartum doula to help out in the first month I was home. It's definitely a luxury, and we are lucky that we were able to afford it, even if it meant that we had to make some sacrifices to do so, but I wish that it were something covered by insurance, in the same way that prenatal care is covered, so that every new mom could have support. Having someone help both with breastfeeding issues and with things like folding and sorting the endless piles of laundry, and checking in on new moms regularly, would, I suspect, go a long way towards reducing PPD. My doula (which means "mothering the mother") is far from perfect--she tends to be a little bit alarmist and to tell stories about the horrible things she's seen in the field, almost looking for problems in our house--but it's still been helpful to have someone be here on a daily basis, keeping me sane by engaging me in adult conversation. When I had a doula with I., she also made me sit on the couch while she made me lunch, which was often grilled cheese and soup. This doula doesn't do that, but she does make me take a nap and a walk every day, and she encourages me to eat healthy. 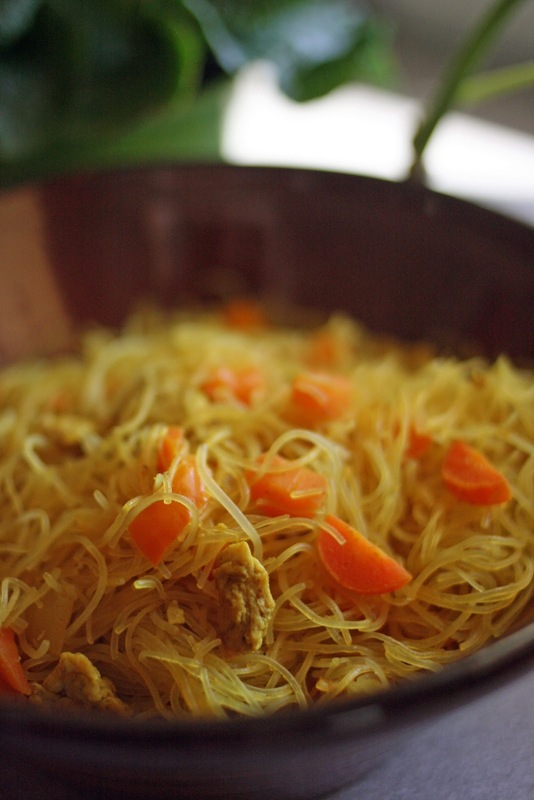 The other day I found five minutes to cook while she was here; I had half a bag of rice sticks in the cabinet, and I'd been thinking about making these noodles for a while. I'm not actually a huge noodle/pasta fan, but something about these appealed to me ... and it was nice to be in front of a wok, even if for five minutes. There are endless variations here; vary the spices and vegetables according to your tastes. Heat oils in a wok on high heat. Cook egg until lightly browned and remove from pan. Add ginger and garlic and saute for a minute or two (add more oil if you need to). Add carrots, onion, and pepper and saute until beginning to soften. Add curry powder and saute for a minute. Return the egg to the pan, and add noodles, soy sauce and broth, and stir until noodles become just lightly browned or liquid is mostly evaporated. Serve! My friend C. (the other C., not the pot pie C.) came over last week to visit. It was good to see her; she's a smart woman with two children and a doctoral degree who made the difficult decision to stay home after the birth of her second child. We talked about how amazing birth is, and then I yammered on for a while about work. To be fair, when my leave was arranged, the responsibilities of my job were divided among people in the office, and it was expected only that I'd check email occasionally and get updates from the people taking over. (So it's not like there were slavedrivers at the helm, as it may have seemed from my other post, though this is complicated by the fact that the terms of my leave, according to HR, require that I be working from home, but according to my supervisors, require that I do nothing.) The nature of my job entails relationship-building with faculty and students, though, and I hadn't planned to ignore those relationships simply because I'm not on campus. It's true, I didn't entirely trust the people who have taken over my responsibilities; that's my problem, and I tried to extend the olive branch and get over my misgivings. But I don't understand the policy change happening without even asking me what I think, and stripping me of the authority to make any decisions about the program that I built, telling me that they'll "revisit my restart date at a later point in time." I don't understand what I did to deserve this. I've given many years of service to my workplace, and I've earned the respect of lots of students, faculty, and staff. So why this? Why now? Anyway ... this is what C. listened to me talk about. And as she pointed out, as long as she's known me, I've been itching for something new. The question is what? And how? Not things I can exactly worry about when I'm just barely three weeks postpartum, though yesterday I got an email saying my name had been passed along for a possible a new position at my university ...not a job offer, exactly, but more of a "you might want to have a conversation about this with the leadership involved." Still, better to focus on eating right, getting sleep when I can, exercising, and getting to know my newest little family member. Keep it simple. Because she's a thoughtful friend, C. brought over a great big bowl of this for dinner: it's not a difficult recipe, but there's lots of flavor. Opt for local and organic when you can find it; this really does make a difference. And leave the complicated politics behind. In a skillet heat roughly one tablespoon of olive oil until shimmering (medium high heat). Add sliced peppers and onions, sprinkle with salt. Sauté until onions turn soft, at this point sprinkle with fresh oregano and thyme. Once peppers are also soft, add two cloves of crushed garlic and turn heat off. Put veggies in a bowl. Add sausages to heated pan with just a drop of olive oil. Turn sausages to medium and cook covered, flipping them half way over. Boil water and cook pasta to al dente. Drain pasta and return to hot pot. Add about one to two table spoons of extra virgin olive oil and salt to taste to pasta and mix. Add diced tomatoes and some fresh oregano and thyme. Sprinkle with fresh grated Romano cheese. 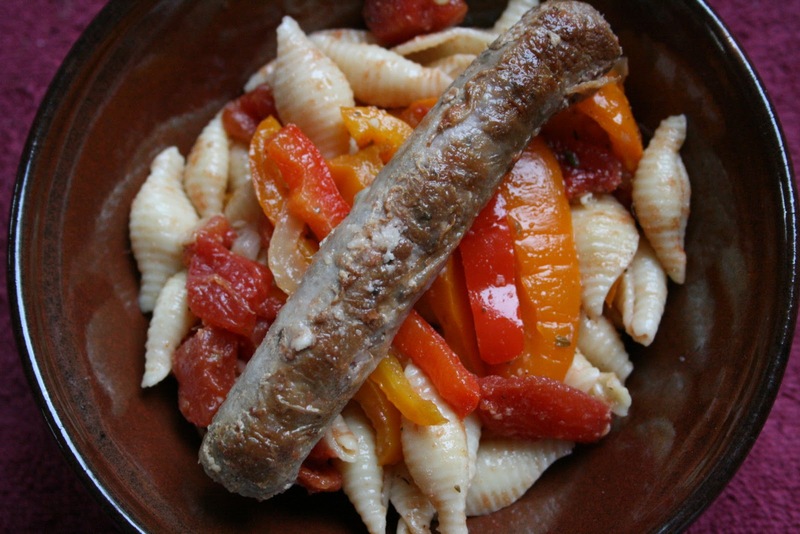 Pile pasta, veggies and sausage on top of each other and enjoy! To me, a sure sign of recovery is finding time to take pleasure in the things that you did before whatever life event happened to you, happened. I'll never forget one of the first things I really wanted to do after I had my son was make an apple pie. Having a newborn makes finding time for apple pie pretty challenging, especially if you're spending an hour breastfeeding and then have just an hour and change to go to the bathroom and do the other things you need to do before the whole process starts all over again. This time, I knew I definitely wasn't going to have time for apple pie, especially given that when my son gets home I want to spend time with him, too. But I did think I might have time for an apple crisp, and I had some apples in the refrigerator that had been long overdue for use. So I tossed together one that I'm sharing the recipe for below, originally given to me by my friend C. (who also brought the pot pie in my previous post), and was pleased that it came together in about ten minutes, long enough that my husband was able to hold and try to quiet the baby, who had just woken up, hungry, as usual. We also got out for a few walks this past week, and enjoyed the fact that it was in the 50s and 60s ... warm enough that I found myself taking off my jacket to fully appreciate the warmer weather. Breathing in what felt like spring, it was hard not to feel like things were back on the road to normal, that I could live with a little less sleep, that I could figure out this whole two-child-family delicate balance. I know myself well enough to know that this state of mind will probably not last (and it's supposed to snow again tonight), but it was nice to feel a little bit more like myself again. Perhaps you'll have time to throw one of these together, too, and go for a short walk while it's baking. Chop apples and rub with lemon to prevent browning. Toss in cranberries. Mix oatmeal, cinnamon, flour, brown sugar and melted butter to slightly moisten mix. You can also add a dash of allspice, crumbled almonds, peanut butter, etc. 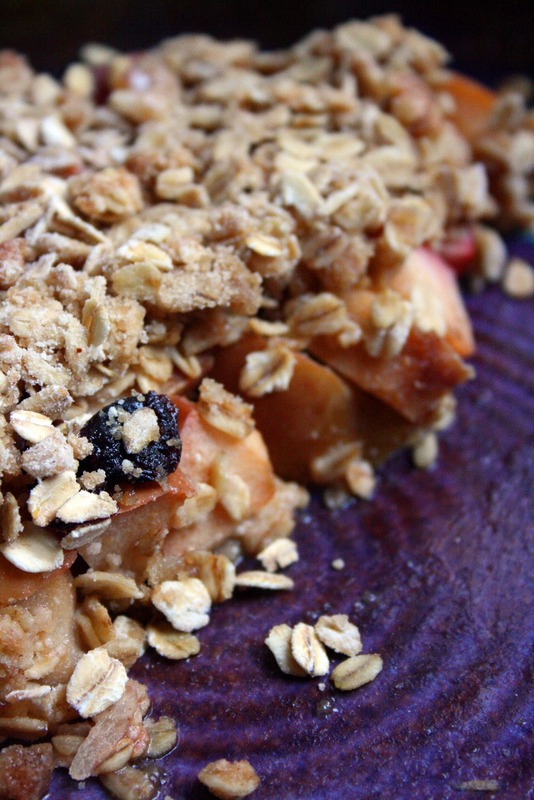 Drop mix on top of apples in dish and bake 350 for a little over 30 min. (until the top is slightly brown and apples have softened). Enjoy with some whipped cream, if you're feeling both hungry and decadent like I was! Since N's birth, we've felt showered in support, both online and in real life. This is good for me because I am feeling miserable about things at work: I had replied to some inquires via email in ways that I thought were fine, but didn't cc people replacing me so they knew what I was doing and why, and was accused of "calculating to cause confusion." As any late term pregnant woman or parent of a newborn will attest, calculating anything is pretty much beyond my ability these days ... I'm lucky if I've taken a shower. I am not sleeping for more than two hours at a stretch. It almost seems like they want me to quit so they can restructure the office. If that's the case, I wish they'd say so, because between my whacked-out hormones and increasing anxiety about my value at work, I'm going to need to call a therapist in to do home visits. One of the things we seem to have no time to do this time around is cook ... it's remarkable, really, how the addition of one small person to your household can throw everything into upheaval. Luckily, we've had some friends make us dinner, which has been a godsend. The other night, one of our friends brought over a pot pie that we devoured, along with an apple crisp and salad. I figured since I'm not doing much of my own cooking these days, I'd blog the gifted pot pie, with my gratitude to C. for a home cooked multi-course meal, and for nourishing the body and spirit. Brown chicken in pan, steam whatever veggies you want until just tender. In pan, melt butter and add flour, stirring until caramel-colored (maybe 2 or 3 min. ), then slowly stir in stock, cooking until thickened. Take off heat. Add in salt, pepper and/or paprika to taste. You can add more stock or milk, if too thick. Curry is also nice, or add grated cheese for an "au gratin." Mix in chicken, veggies and "gravy". 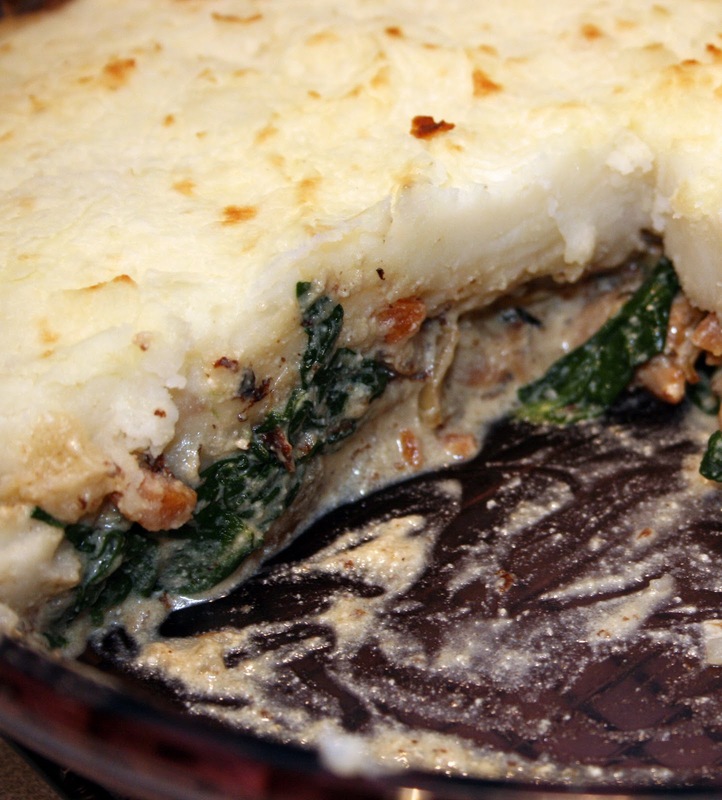 Pour into baking dish and top with home-made savory crust or store-bought puff pastry. Bake in accordance with pastry instructions. Here she is, fully baked! Oddly enough, the Bean was born not long after my last blog post. Here's the story: after our Indian food dinner, I was having contractions sporadically throughout the night, sent I. and S. to school and work at 7:30 the next morning. I decided to take a walk to see if I was really in labor, and left the house at 8:30, measuring contractions about 5 minutes apart; but I got about half a mile down the road and turned around, feeling like this was not a good idea. I called S.: by 9:30, he was home, and contractions were 5 minutes apart, getting faster. We decided to stay at home for another 20 minutes or so, and before we knew it, contractions were coming 3 minutes apart. I suggested we leave for the hospital, and told Steve that he'd better not make me put on my seat belt, because I'd be damned if anyone was going to prevent me from squatting (which my body desperately wanted to do). S. drove as gently as he could. We arrived at the hospital, and I had two contractions in the parking lot. By this point, I was barely hearing what people were saying to me. Some gentleman helped me into a wheelchair, and took us around to a back elevator. The Bean was born 7 minutes after we arrived at the hospital. Fully baked, folks. The miracle is, indeed, possible. Before I leave for the hospital, which may happen any day now, and become much less effective at cooking and blogging for a while, I'd like to thank the Academy. Or in this case, the blogosphere. Melissa at You Found What In There? I have doubtless forgotten some of you who read and comment regularly ... if that's the case, please forgive me! Last night I went to my 40 week appointment, and the baby's heart rate was a little high, so we went up to Labor and Delivery for a non-stress test. For the most part, it was good ... there was a dip in the heartbeat after a contraction (which I've been having on and off anyway, and was having more of, and stronger, last night), so they kept me on the monitor for longer than we were expecting, but the midwife said in general the baby looked happy, and it was probably just because they didn't have the head of the bed high enough, and I was lying on my vena cava. They finally let us go, and we went to get some Indian food, which I've been craving for a while ... at this point, I keep thinking that every meal may be my last before labor, so I'm trying to make sure I sate all cravings! One of the things I seem to be craving on a daily basis is spinach. This is a great winter dish; filling, but healthy, full of veggies, and easily customizable for the vegetarians among us. Here's hoping that if you live in the Northeast, you're surviving the relentless winter storms and ridiculous amounts of snow and ice, and if you live elsewhere, know that we're living vicariously through you, waiting (somewhat more impatiently now than before) for spring. Place potatoes in a pot and cover with water. Bring to a boil and cook, uncovered, until tender. While potatoes are boiling, set oven to 375°F. Lightly coat a heavy-bottomed skillet with cooking spray; place over medium heat. Add carrots, onion, and thyme. Cook until slightly browned, stirring often. Add chicken (or tofu) and cook until golden brown. Turn off heat; stir in spinach, ricotta, and salt. Drain potatoes well, then return to pot. Add olive oil, milk, and salt, and mash till smooth (some lumps are okay). 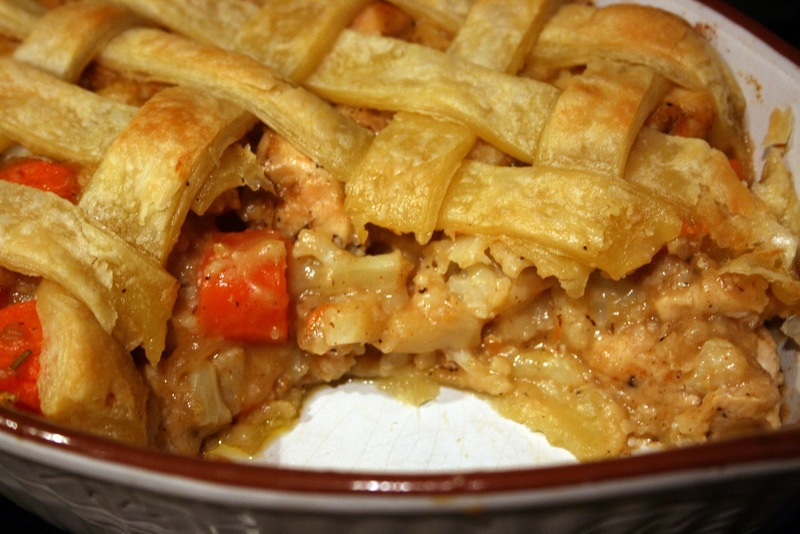 Place chicken (or tofu) mixture in a 9-inch pie pan, and top with mashed potatoes. Bake for 15 minutes. To brown the potatoes, broil for 5 more minutes.